Following an initial survey to identify elements of the building at risk from falling masonry, Triton were awarded the Main Contract to undertake a geophysical survey of all the statuary and an inspection of over 400 stone roses to the cornice before carrying out all essential stone restoration and general external maintenance works. The City of London can be a difficult place to work because of the rules that are imposed on scaffold erection and lighting, rubbish disposal and deliveries, and parking. Using purpose made tools, each stone rose was tightened or, as appropriate, removed entirely to undertake a pull test to the fixing and undertake essential repairs. Only a few stone roses examined were found to be loose and, with the exception of the replacement of a handful of non-commercial grade alloy bolts to match the existing, the restoration work proved minimal. 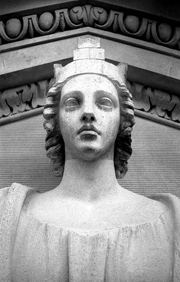 Of the statuary, only the 3 metre high statue of “Commerce” was found to be in a poor condition. The neck and shoulders were severely fractured, the result of a rusted ferrous dowel and the head was found to be completely severed and held in place by its own weight. Preserving original masonry where practicable, a new neck and shoulders were re-carved in Perryfield Whitbed Portland limestone. In addition, a variety of sculptural details were re-carved, including fingers, noses, feet and the detail from a knotted rope and loose wall panels replaced, with a matching batted finish. 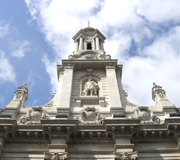 After cleaning using fine nebulous water sprays, a detailed inspection of the stonework revealed extensive spalling and over 70 new Portland stone indents were fixed, with all rusting ferrous cramps replaced in stainless steel. Additional works included the making good of redundant fixings with a matching Portland stone restoration mortar, re-decoration of all previously painted surfaces and remedial works to the York stone paving, where differential weathering of the York stone and asphalt grouting presented a serious trip hazard. The project administrator from DTZ Debenham Tie Leung commended the finished appearance and quality of the workmanship and considered the client’s money to be well spent. On the strength of this, Triton were appointed to undertake work to the east tower, and subsequently completed 3 No. external phases as well as minor maintenance projects.